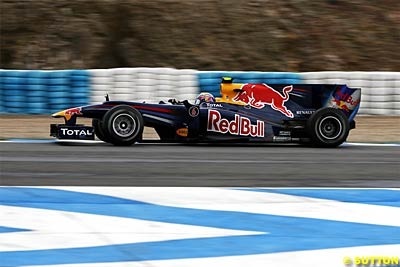 The next test session in Jerez is promising to be a cheery affair, what with severe rain forecasts and flood warnings. It will be interesting to watch all the F1 teams huddled up in their respective motorhomes watching the cars floating in the garages outside. With the testing regulations and all that, we can’t help but feel half the grid is going to get the first decent run only during the Bahrain GP, adding a whole new dimension of variability to the proceedings (Can the Virgin front wing last 10 laps? Is USF1 really going to be there on the grid? Did Campos get the brake and accelerator pedals interchanged?) So when Kimi says boring and unpredictable, he clearly doesn’t have a clue. There was an interesting news piece on Pitpass yesterday on majority of the Mercedes former management resigning, and to be replaced by Mohamed Badawy Al Huseinny (and if that’s only one man, then a few others from Aabar Investing Fund as well). But today, a Mercedes spokesman has dismissed the reports – “”I can confirm that Nick Fry remains at the team in the position of chief executive officer”. The spokesman adds that there is no big change forthcoming, except they have fired the cook in the Mercedes motohome. “There was a lot of negative PR because Michael was always dashing off to the Ferrari motorhome for lunch” clarifies the spokesman, “Now we have a Italian chef who can make spaghetti aglio e olio pasta with garlic and olive oil as well as the next person”. Michael was not available for comment. The British media have been busy the past week wondering what could possibly be the reason for Ferrari topping the charts at Valencia last week. Never mind that Ferrari has won 8 out of the last 11 world constructor championships, one would have thought Force India topped the charts judging by the reaction. One interesting theory presented was that Ferrari omitted to add 30 kgs of ballast to the car, an honest mistake any team can make, and after all the self-congratulatory pats on the back for having exceeded expectations, were chagrined to find the missing ballasts hidden behind the extra tyres. We can see that going down well with Luca di Montezemolo. Or wait, maybe it was a deliberate ‘mistake’, much like our beloved Schumster parking in Rascasse. Maybe Ferrari thought it was a wonderful idea to corner all the pre-season hype only to fail spectacularly in the first race. Well, clearly we are not the only ones in the fake news business, that’s for sure. We hear Red Bull’s got a bit of a problem. Adrian Newey, in his quest for aerodynamic perfection has designed such a unique raised nose that it’s pretty much all the driver can see from the cockpit. Maybe they should have just stuck to the previous year’s design, much like Force India. Force India has cleverly restricted all their innovations to the steering wheel. We have already highlighted their desire to just have a car that runs, which is actually a clever strategy. This way, they will surely finish ahead of at least five other teams that seem destined to merely form immovable hurdles at the race start. And there is further action in store presented by teams such as Virgin, where you never know when the car is going to disintegrate all over the track, as it did in Jerez today, with drivers no doubt having to drive warily around to avoid the odd piece of debris. Thankfully DC has retired, I doubt our hearts could have withstood that added excitement, given his well documented stopping-in-the-rain routines and attempted decapitations. Ferrari is looking increasingly consistent and reliable at the Jerez tests, all positive signs leading up to the season. Bring on Bahrain! Forza! I will leave you with a bit of Ron-Speak, just so we can be grateful we are not subjected to this on a regular basis anymore. “You have one driver preceding the other and feeling that he had to catch up. You have all these very, very different chemistries, and it’s just not the case with two drivers who have got like-minded approaches, an Anglophile approach”. And this was all in reply to some unsuspecting journo asking Ron about the Hamilton-Button pairing in McLaren. We (at FFN) have been wondering about the new point system a bit. You know, the newest 25-18-15-12-10 one, awarding the winner with a whopping 7 point lead. It feels as though the powers that be in F1 have a sudden sneaking suspicion that lack of overtaking might have little to do with the cars and tracks after all. In the recent past, the governing bodies have been throwing everything they could lay their collective hands on into making F1 a better sporting spectacle, meaning more cars overtaking and less resemblance to a ruddy procession. If this meant sweeping aerodynamic changes or the blessed KERS or even shortcuts, so be it. And then some bright chap in some Council approved a proposal from a different commission, the gist of it being to provide a bit of incentive to the drivers to actually want to overtake. 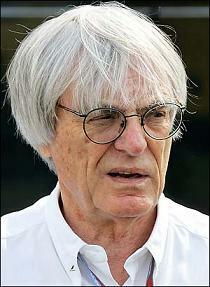 We think it’s a rather bright idea, our only concern being Bernie Ecclestone agrees. “The idea was to make a much bigger gap between first and second” says Bernie, “give people the incentive to overtake, not to sit there getting points”. Uh oh, what did we miss? Jenson Button, it has to be said, is far more diplomatic than FFN when it comes to voicing opinions on anything Bernie. He thinks the ‘shortcuts’ idea is rather ridiculous of course, but seems to suggest it is an exception rather than norm. “We struggle seeing anyway out of the sides of the cars, because the cockpit comes up to here for safety reasons. So if there is a car coming at an angle, it can be very dangerous” says Jense, “It’s probably not one of Bernie’s better ideas”. Oh, we think it is one of Bernie’s better ideas, which doesn’t say much for the standard I suppose. Meanwhile, Force India’s design director Mark Smith is not upset about skipping the Valencia test last week. “As long as we are ready to go the Jerez test with a car that will run then it’s better for us” he says, and you have to agree. Car that runs is definitely better than car that maintains its state of inertia at rest. Nico Hulkenberg is also feeling the pressure, not that he is driving for Force India. “Williams expect me to deliver a good job, to drive quickly and do well for them. They would not appoint me as a driver if they didn’t expect something from me” says the clearly inexperienced youngling. If only he had read a bit of F1 history, he would know Williams specialize in appointing drivers no one in their right mind can expect anything out of. I mean, he’s got Rubens Barrichello as teammate for heaven’s sake! 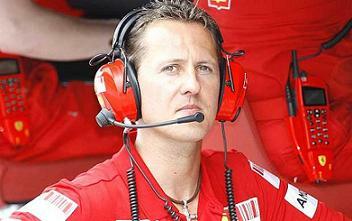 I bet if Ralf Schumacher were to make a comeback, Williams would sign him up without a second thought. Speaking of Rubens, we hear he had been urging young Rosberg to bolt out of Mercedes, now that Michael Schumacher is his teammate. Acts of courage, indeed. Bring on the Jerez test then, keep fingers crossed that Ferrari goes fastest there as well. Forza! Williams have declared that they are going in for a ‘clean-sheet design’, which is the best way to go really when you have produced a string of turkeys year after year with unfailing consistency. In fact, I think it’s for the best if they burn all the previous design documents, just in case they are tempted to take a quick peek as to where they attached the steering wheel last time around. Sam Michael also seems to have a lot of (misplaced?) optimism in the driver lineup. “We have managed to sign the German managed by Willi Weber” he told us proudly in an exclusive to FFN, and we didn’t have the heart to put a damper on his enthusiasm by pointing out they’ve already tried this before with Ralf Schumacher. As for Rubens Barrichello…well, given his tendency to sue bloggers who feel rather differently about his capabilities on track, we shall refrain from comment. It would suffice to say we don’t share Sam Michael’s sunny optimism. We hear Nick Heidfeld is cursing Michael Schumacher a goodish deal in his spare time (of which he has plenty these days), and you can’t help but feel a little sympathetic. When Mercedes (Brawn) announced they were settling for an all German lineup for 2010, Nick was confident it was a done deal. Naturally he is not very pleased with the new developments, and if there’s one person who is not waxing on eloquently about how Michael’s return is good for F1, it is Nick. Good for F1 maybe, but a disaster for him personally, as he has now been announced as Mercedes reserve driver when all a reserve driver does these days is pretty much sit in the garage and twiddle his thumbs. It’s all down to the grooming we think, after all, with Nico Rosberg looking like a pretty Hollywood actress, who will go in for the Chewbacca look alike? 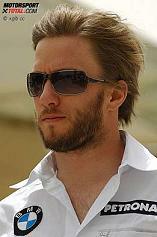 Moral of the story – A shave in time saves a F1 career. Or something like that. Meanwhile Heikki Kovalainen is busy hitting back at critics who are discussing odds of Heikki being the next Finn to go rallying. It is said Kimi will consider switching back to F1 mid-season, and maybe they can just trade places. While an elegant solution no doubt, Heikki is convinced he has a long and prosperous F1 career ahead. “If Rubens can be in F1, why can’t I?” reasons Heikki, “After all, I have beaten Michael Schumacher in RoC. And the only thing Rubens has ever beaten Michael in is in Backgammon…plus I am a hundred years younger”. Very logical, you have to admit. Heikki also suggests that his reputation as a poor racer is not ‘a true reflection of his many talents’ (of which perhaps racing is not one?). “I didn’t get the best out of the McLaren” he admits (in a gross understatement), “I don’t think there are any areas I particularly need to improve”. That’s twisting the truth a bit, one particular area where we feel there’s definite room for improvement is driving a F1 car at reasonable speed. “Some people think I’m a good qualifier and not such a good racer (like some kind of reverse Jenson Button? )” he adds helpfully, “But that is only in McLaren. If you look at my time at Renault in 2007, the race performances were actually very strong (but the qualifying not so much)”. The key to this whole racing thing, Heikki, is to do both the qualifying and racing part well in the same year. Not much news on the Ferrari front, except the new 2010 livery looks like they couldn’t decide till the last minute if they wanted a red car or a white car, with the end result the car now looks like a red-and-white zebra. Still no comparison to the Renault rainbow of 2007 or the Honda Earth Car. And as long as the car can race like a Ferrari always races, we should have a good season ahead. Forza. No doubt there are sinister machinations afoot at Mercedes headquarters. I am sure Nico Rosberg has been having sleepless nights ever since he heard he was going to be the ‘other’ driver in a team that has Ross Brawn and Michael Schumacher…not that Ross will be doing any driving…his role will be strictly restricted to eating bananas and looking intelligent on the pitwall. Rosberg confessed recently that he had a really bad nightmare, that the new president of FIA, Jean Todt, was present at every race, instructing Rosberg over the microphone to “let Michael pass, I repeat, LET MICHAEL PASS”. Not the ideal situation you have to agree. For all the brave talk Rosberg has been doing about beating Michael and being the king of the world, he has kept a wary eye on the proceedings. So when Michael Schumacher recently declared that he wanted the No 3 car because he is superstitious about even numbers, it is fair to assume Nico’s hackles are up and he is all ready to bite if the need arises. It’s a pity Michael is not more like Lewis Hamilton. Hamilton, you remember Ron Dennis told us, is apparently beyond human emotions, a spiritual kind of chappie. Michael unfortunately still believes in initimidating his opponents, starting with his teammate first. Conspiracy theories aside, maybe Michael really is superstitious. Martin Brundle once said that Michael went out looking for four leaf clovers before every important race (it’s a bit odd it’s not a three leaf clover considering…). No doubt he didn’t find one before Jerez 97 and got all into a nervous twitter…and we all know what happened next. Or Suzuka 1998 for the matter. Who would have thought what is often mistaken for Michael cracking under pressure and making a hash of things is actually Michael’s inability to find four leaf clovers? 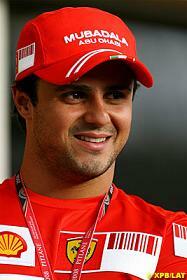 Felipe Massa recently confessed that he has been following Michael’s advise since 2007. “Michael has made me the driver I am” he declared proudly the other day, “It was Michael who told me to wear the same underpants through the race weekend if Friday turns out well. It works like magic”. Michael was clever enough to hand out this advise just before his departure in 2006, but no wonder poor Kimi Raikkonen has given up on F1 and taken up rallying instead. And unsuspecting Fernando Alonso knows nothing about the grave assault in store for his olfactory senses every other Sunday. Talking of other driver superstitions, Alex Wurz likes to wear different colored shoes on race weekends, not that it helps his performance any. Mark Webber likes to get dressed in the same order – underpants, socks, pants, shoes – which I suppose works the same way for everyone unless you are Clark Kent. It remains to be seen whether the FIA and Mercedes management would agree to Schumacher’s request, innocent or otherwise. But considering Todt is president of FIA, and Ross Brawn is team boss, I am thinking the answer is probably a resounding yes. Give it some thought though – all the exciting things that Michael’s ever done, from winning championships to parking in Rascasse, have all been in odd number cars…can you really blame the man? There, I didn’t think so either. What’s the (F1) World Coming to? This is most disturbing. I know I’ve been in hibernation for a year or so, but really, who would have thunk?! The Iceman has gone rallying, our very own super assistant has gone behind our back and signed for Mercedes (just when the general audience was beginning to understand what a super assistant really does), and we have good old Nando in Ferrari red proudly displaying the Santander logo. Todt is the new president of FIA (I bet Nando won’t call it Ferrari International Assistance any longer), Ron Dennis is finally gone, and Flavio…well, dear Flavio is always getting into some trouble or the other. This time apparently he thought it would be funny to tell Nelson Piquet Jr to crash (it’s a bit like asking Nick Heidfeld to look like Chewbacca) and Nelson was so thrilled on being asked to do what he does so well for a change that he executed it in perfection. It’s good that indignant Flavio got the lifetime ban overturned, a pure case of witch-hunting, this! As if Nelson wouldn’t have crashed if Flavio hadn’t asked him to! Oh, and did I mention Jenson won the world championship? You can easily understand why my head’s reeling a bit as I type. I am already missing Kimi a bit. Agreed he had about as much animation in his eyes as that of a dead fish, but the Iceman was still a bit special. Who can forget the gorilla costumes and James Hunt pseudonyms? And now we have to change the website logo, which is a darned nuisance by the way. Oh well, at least we still have dear Felipe, a fighter as always. Talking of which, what has come over Michael Schumacher (Or his evil twin, as Luca di Montezemolo would have us believe)? So he got the racing itch, and there was a small logistical problem at Ferrari (2 Ferrari cars is not divisible by 3 drivers), but if he had been a bit patient, I am sure Bernie would have found the way. Yes, Bernie Ecclestone. Clearly a man who can reveal he would like short-cuts at every circuit with a straight face is capable of thinking up some creative solution to this problem. I attribute this whole fiasco to inviting Michael to every other race by the way. No good racing driver can sit on the pit wall and watch his erstwhile colleagues make a hash of it race after race without wanting to jump in the car and show them a pointer or two. Anyway, no use crying over spilt milk, so we resign ourselves to watching da Michael in gray overalls and red helmet, a fashion disaster as always. Talking of fashion disasters…I mean fashion, I must say the red sits pretty well on young Fernando. Better than blue anyway. And is it just me, or has his neck slimmed down quite a bit? No more talks of fat necks, bushy eyebrows and mental instability by the way. We have always been very fond of Fernando Alonso here at FFN, and as a grand welcoming gesture from now on, we shall only focus on the positives. Anything else is just an endearing quirk. 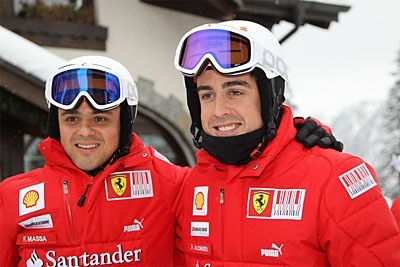 With Fernando and Felipe at Ferrari, we are very tempted to change FFN to FFFFN, no that’s not what I was going to say…we at FFN are very excited about the 2010 season. Bring it on! Forza Ferrari, as always! Unless you have been desperately trying to avoid the glare of the global media by living under a rock for the past week (no names mentioned of course Pinocchio), you will no doubt be aware that the FIA have decided in their infinite wisdom to adopt some rather dramatic and draconian rules for the beginning of the 2010 F1 season. Well we say the FIA, in reality lets be clear and say Max Mosley, since it would seem whatever he fancies these days goes with very little opposition from his minions, and who can blame them? We wouldn’t much fancy a good thrashing with a cat o’ nine tails either. The FIA president has dropped somewhat of a proverbial bombshell on the F1 fraternity, by the introduction of a voluntary £40 million budget cap. Before you get all excited and start clambering to get your hands on expensive copies of Kimi Raikkonen’s trendsetting red head gear perhaps we should actually explain. In an ‘alleged’ effort to secure the future of the sport in times of economic doom and gloom, the proposed £40 million budget cap per team is intended to make it cheaper for Formula 1 team to operate in the sport at competitive prices. It is also intended to allegedly reward those who can be innovative with a reel of sticky tape, two egg cartons, an empty washing detergent bottle and unlimited ice lolly sticks, and be slightly less rewarding of those with a fancy designer italian leather chequebook and endless euros at their disposal. Unfortunately the proposed voluntary budget cap, comes with some rather ‘interesting’ smallprint and conditions attached. Those teams who can compete within the £40 million can pretty much get away with anything they want, including having movable front and rear wings, unlimited engine revs, extra KERS (although that does beg the question who would actually want it) and as much testing as they can cram into the season. 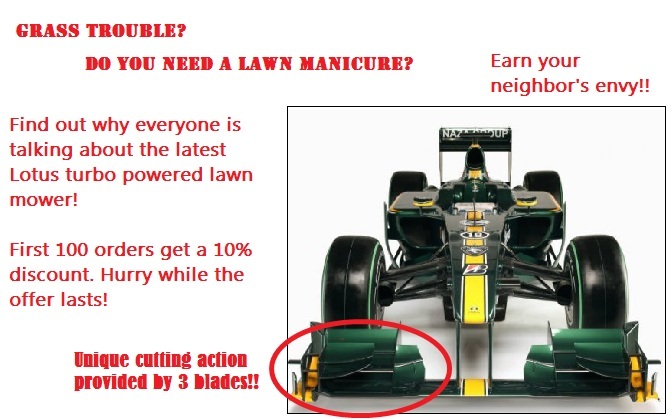 While those who struggle to downgrade the cost of their F1 operations, are basically going to be allowed to race the untested reconditioned lawnmower from their garden sheds. Sufficed to say, these new rules caused somewhat of a stir in the undergarments of several F1 bosses up and down the pitlane, as effectively the rules would be introducing a two-tiered system, with one set of rules for the low budget new boys, and another for the more longstanding big budget boys. We simply can’t imagine this happening in any other sporting arena, where there are only one set of rules and regulations. Can you imagine Manchester United playing Altrincham FC for example? Except in this case Manchester United would only be allowed to field 11 men hopping about on one foot, blindfolded and twirled around three times in comparison to their able bodied counterparts. While it might be amusing to watch Man U get a good thrashing start with, having two sets of rules is farcical….particularly when the FIA who govern the sport usually struggle to get to grips with one set….let alone two. What next? Giving detailed instructions to the race stewards about which coloured cars are allowed to overtake and which are not? It comes as hardly any surprise though, that these proposed regulations were met with much gesticulation, arm-waving and Mamma Mia’s in the vicinity of Maranello. Ferrari and FOTA President Luca Di Montezemolo reportedly firing off strongly worded complaints to the White Star Line (oops I mean FIA) which were met with the usual dose of Max Mosley’s contempt and derision. In retaliation to this alleged fan mail, Max has insisted that F1 can survive without Ferrari if they don’t like it, thank you very much. Naturally this has led to speculation that Max has now got somewhat bored of picking on McLaren now that former Team Principal Ron Dennis has departed the scene, and has now switched his beady eyes in the direction of the Maranello outfit. Although personally we feel he may actually have trouble getting an argument out of Stefano Domenicali, who seems to be the most perennially cheerful man on the planet. In response Ferrari have reiterated their commitment to F1, but the tifosi have been left feeling rather irked with the FIA President, who only last year was telling us how historically important Ferrari were to the sport. We do wish he would make up his mind….and actually get on with retiring like he has promised for the last half century. F1 supremo Bernie Ecclestone meanwhile has stepped into the fray, and promised to protect Ferrari and it’s President with all four foot 3 inches of his powerful presence….assuming Max Mosley can actually see him down there of course. According to the half pint-sized supremo you don’t want to go getting yourself into an argument with Max because he is so clever….which leads us to wonder if in fact there are two FIA Presidents, as some of the decisions emanating from Place de la Concorde of recent times seem frankly laughable even for a village idiot. As ever though it seems Bernie is pretty adept at knowing where the money is at, and after all what other team has such a fanatically deranged fanbase that would mortgage their grandmothers for the prospect of sitting on a rather uncomfortable concrete block in a hugely overpriced red shirt for 2 hours for an extortionate sum during an economic crisis? Considering the tifosi make up a pretty large proportion of the F1 fan base, we’d like to see them fill the grandstands and extort ridiculous annual fees out of all the race tracks without the presence of the barmy red flag waving brigade. It remains to be seen if this is yet another ploy by the FIA to herd FOTA where they want them, and if FOTA are willing to go along like good little sheep….or if the sheep might actually bite back. Meanwhile, the rest of Ferrari have been busily concentrating on developing and testing the F60(B) according to media reports. Last weekend the Maranello squad were testing their new gadgets and gizmo’s at the Vairano test track in Italy. Test driver Marc Gene carried out the 350km straightline test (excluding the times when he had to actually turn around or end up in Calais) to assess the new fangled improvements. It is rumoured the upgrades to the F60, including a new floor, interim diffusor and various aerodynamic changes (including Luca Di’s latest hair trim) will be bring somewhere in the region of 0.6 seconds to the speed of light to the Maranello charger. According to reports in the Finnish Media, the Italian squad have managed to shave off an astounding 15Kg from the weight of the car to improve the use of the KERS system. Alongside suggestions of lighter body parts (the car’s not the driver’s we hope) it is also rumoured the Maranello boys found all sorts of debris in the footwell of Felipe and Kimi’s chargers. Allegedly, Kimi’s footwell was full to brimming with copies of the Times Crossword, various inflatable animals and a 1st edition tome on effusive public speaking, while Felipe’s was in danger of becoming a fully established 1980’s aviator sunglasses emporium. 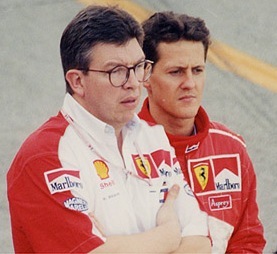 Test Driver Marc Gene has suggested that the upgrade is the biggest he has ever seen at Ferrari, which no doubt has led to some teams Technical Directors hopping from foot to foot in nervous agitation like men in a department store changing room lest their’s should turn out to be less well endowed. Noises emanating from Ferrari HQ suggest the team are quietly pleased with their progress, but the last time they counted their chickens, they ended up with only three points on the scoreboard and a lot of egg on their faces. So we can only hazard a guess that every available appendage is crossed back at the factory in hope they have done enough to take the fight to the likes of Brawn and Co.
McLaren who have recently been let off the hook for their grovelling apologies to the FIA over liegate, have reportedly begun fretting already that their upgrades will not be as big as other teams and are concerned they may be leapfrogged. We’d suggest keeping out the way of Robert Kubica then as he has already had a good go on Jarno Trulli recently. The F1 teams will be arriving tomorrow in Barcelona for the Spanish GP….so all we can do is wait for the next enthralling installment in the F1 soap opera…..the only difference is here at FFN we are still waiting for a mysterious shooting like in Dallas….